With the recent surge in popularity for Vietnamese cuisine, it can be hard for us to keep visiting chain restaurants in order to satisfy our cravings. But these days, Vietnamese fare has become increasingly prevalent in hawker centres as well, which means we get to enjoy them at a more affordable price point. 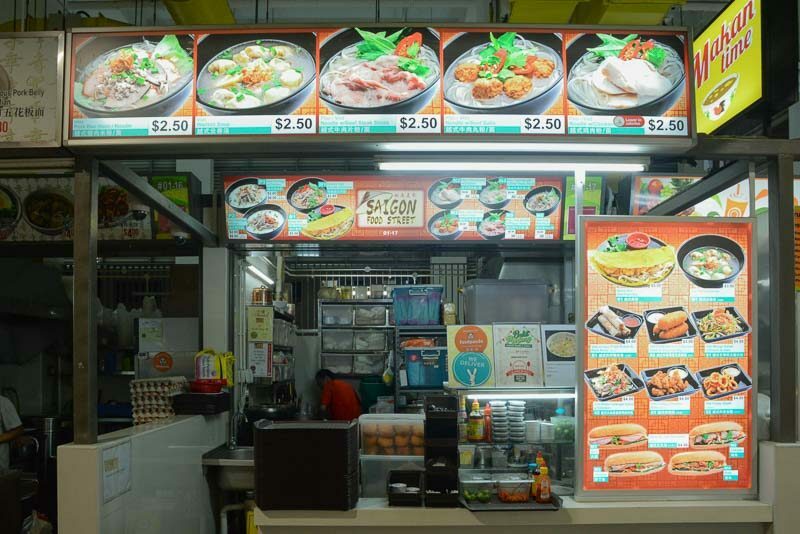 Situated at Bukit Panjang Hawker Centre & Market, Saigon Food Street is one such example, and is quickly becoming one of my favourite hawker stalls. 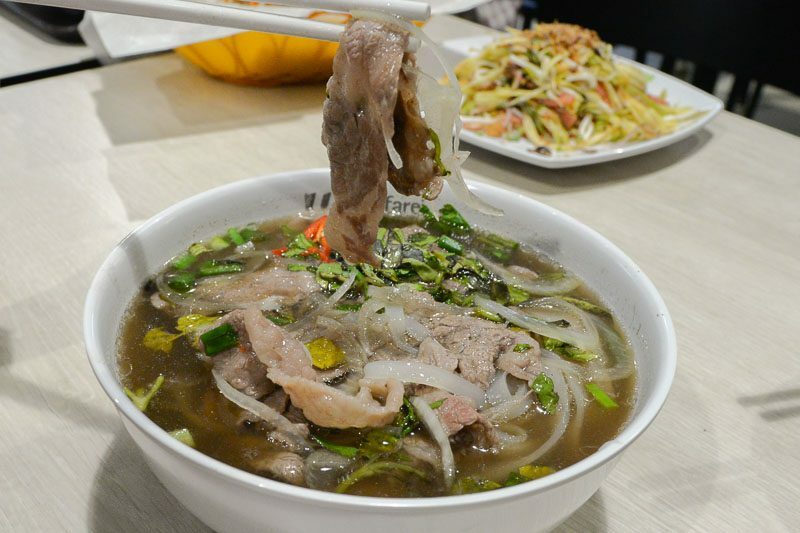 Here, Vietnamese classics such as pho go for as low as $2.50 a bowl. Most of the other dishes such as assorted banh mi (Vietnamese baguette) and fried spring rolls don’t go above $5 as well. To start off our meal, we opted for the Mango Salad with Prawns & Ham ($4) and got a large mound of it. 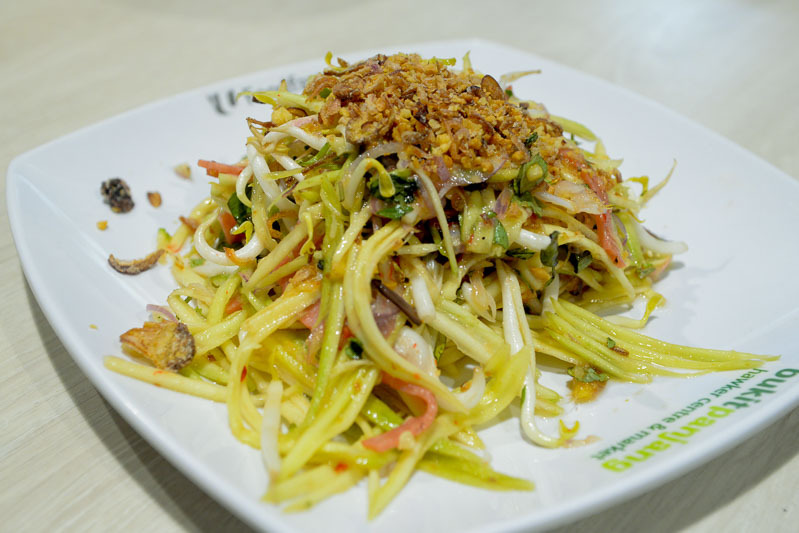 Slightly sweet, tart and tangy, the semi-ripe mango strips came with halved prawns, strips of ham and bean sprouts for that all-important crunch factor. The peanut shavings were a nice touch that added some nice nuttiness to the dish. Definitely gonna ask for more of it next time since there wasn’t enough of it to go around. Overall, a great opening dish to whet our appetites for the upcoming dishes. 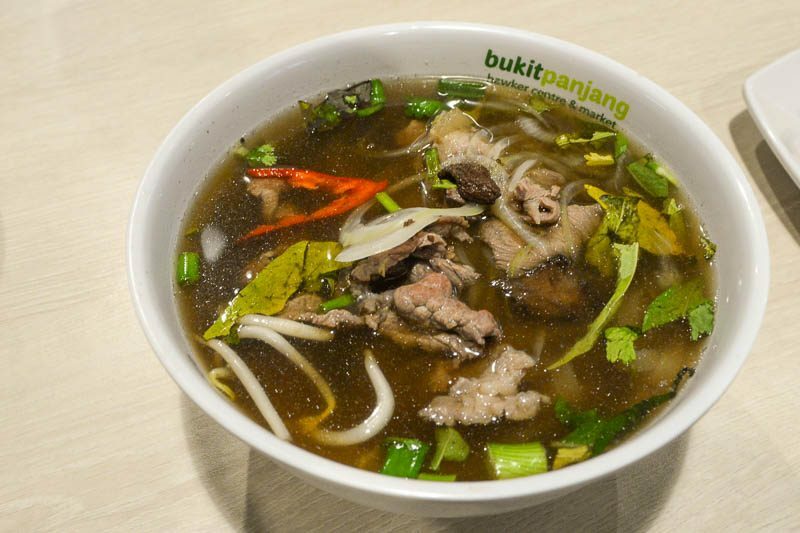 Our first main course was the Beef Pho – Small ($2.50 for small, $5 for regular, choices of beef steak slices, beef balls, pork or chicken). Despite its lower price, we were still given a decent amount of beef slices, about four to five pieces, and a pretty hearty portion of noodles and broth. Garnished with bean sprouts, spring onions, coriander and mint leaves, each mouthful yielded a nice crunch from the vegetables. The long-simmered broth here was light but flavourful as well. There are condiments provided such as calamansi, Sriracha and hoi sin sauce should you wish to adjust the taste of your broth. However, the beef slices may be a little too tough and I would have preferred something less chewy. Which brings me to our next dish: Wagyu Pho ($8.50). The wagyu beef slices were much more tender and tastier than the regular beef slices in the previous bowl of pho. Notice the streaks of fat running through the wagyu slices? When left immersed, the wagyu fat will be slowly rendered into the broth, creating an intense and savoury taste that coats your palate with a rich, oily and nutty aroma. You will not find yourself reaching for the condiment sauces for this bowl of pho — it’s more than good enough on its own. Aside from the pho, we had a side order of the Chicken Banh Mi ($4.50) as well. Here, the baguettes were lightly buttered and filled with shredded vegetables, juicy chicken cutlet and drizzled over with Thai chilli sauce. 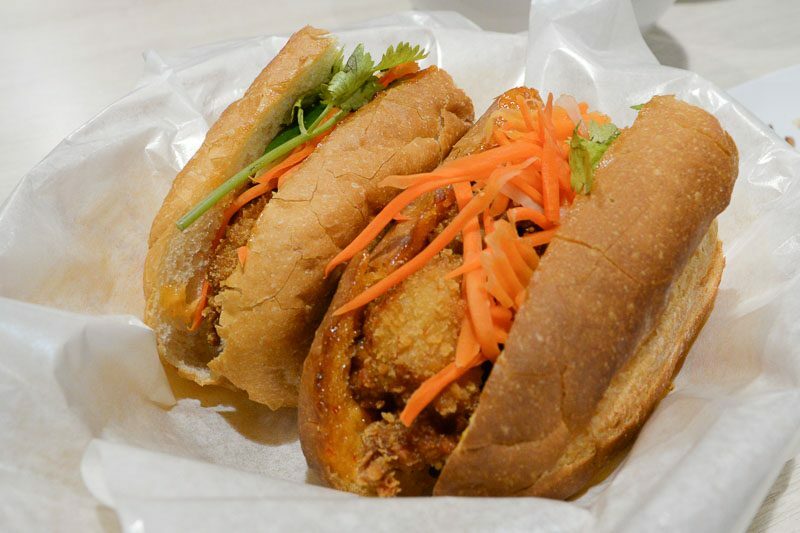 Toasted lightly to a crisp, the Chicken Banh Mi yielded a satisfying crunch as we sank our teeth into it. We especially loved the layers of texture and flavour that this dish provided — it was sweet and salty, crunchy and juicy all at the same time. 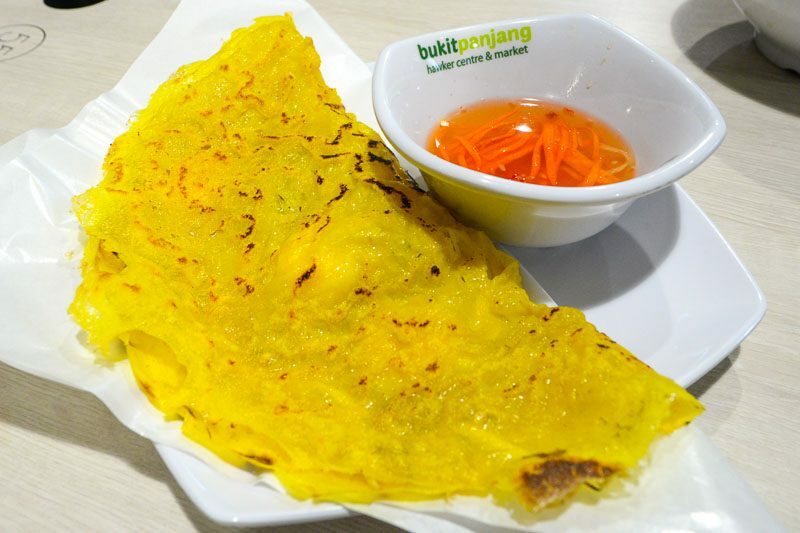 We pushed ourselves to try one more dish, the Banh Xeo ($5) is a Vietnamese savoury fried pancake. 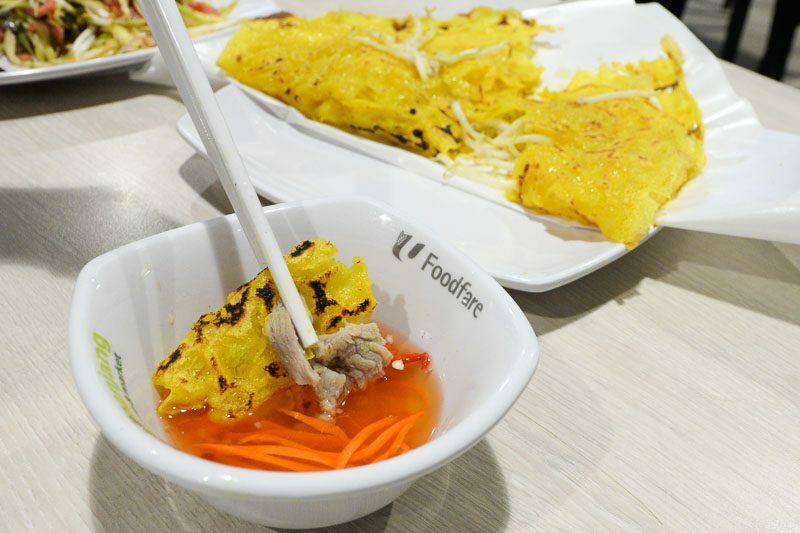 Filled with shredded vegetables, bean sprouts and pork, the Banh Xeo arrived warm and crispy. We managed to break it apart easily with our chopsticks. Accompanied with a slightly vinegary and fish sauce to cut through the oiliness, this dish was good but not nearly as outstanding as the previous dishes. We also felt there was a little too much of bean sprouts in it. While we understood that the idea was to make the dish super crunchy, perhaps adding more shredded carrots and shaved peanuts instead would achieve the desired effect in a more balanced way. After a chat with the owners, we found out that the lady boss actually used to work as a chef for NamNam Noodle Bar, the insanely popular Vietnamese pho chain in Singapore, before deciding to strike it out on her own with Saigon Food Street. While I won’t compare the two establishments since that’s not the intended purpose of this review, I believe that the Vietnamese fare served here definitely stands on its own merits. For great-tasting yet affordable Vietnamese fare, Saigon Food Street is a great option that will satisfy your cravings while going easy on the wallet.